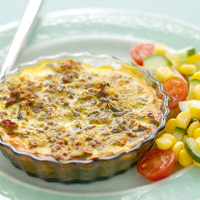 This mildly spicy meat dish with an egg custard topping, was declared the national dish of South Africa in 1954. It’s sure to become a family favourite. Preheat the oven to 180°C, gas mark 4. Heat a large non-stick frying pan and fry the beef over a medium heat for 2-3 minutes, stirring all the time. Add the onion and cook for a further 4-5 minutes, stirring occasionally, until the onion starts to soften and the beef is lightly browned. Add the garlic and curry powder and fry for 1-2 minutes to allow the spices to cook. Remove the pan from the heat and stir in the mango chutney and sultanas. Pour about 200ml of the milk into a small bowl. Tear the bread into small pieces and add to the milk. Leave to soften for a minute then stir into the beef mixture. Tip the mixture into either 6 individual shallow ovenproof dishes, or a 2-litre shallow, ovenproof dish. Press down well with the back of a spoon. Mix the remaining milk with the eggs and a little seasoning, and beat lightly. Pour over the beef and place in the oven for 30-40 minutes until the mixture is piping hot and the top golden brown. Serve with a light salad of chopped cucumber, cherry tomatoes and sweetcorn. There are many variations of this dish. For example you could add chopped dried apricots or apricot jam instead of chutney. If making in advance, follow steps 1 and 2, then add the soaked bread, and egg and milk mixture just before cooking.